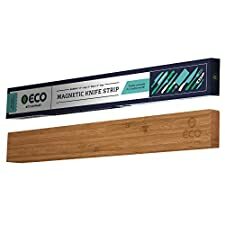 Keep your knives safe, secure and close at hand with the Magnetic Wooden Knife Rack by Good Cooking. 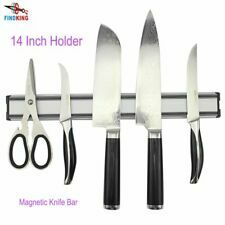 The extra-strong magnetic strip in the knife rack keeps your knives and other utensils organized and easily accessible while prepping and cooking your food. With your knives securely attached to the knife rack, you can keep your knives sharper, cleaner and protect them from nicking and dulling. Hanging slots in the back of the rack make for easy mounting on your kitchen wall. Crafted from all natural beech wood, this magnetic wooden knife rack blends in seamlessly with the contemporary household. Want to de-clutter your cooking areas and work spaces? 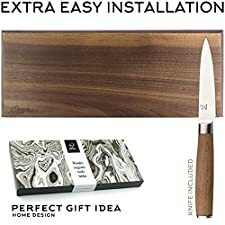 Here's a sleek, safe, super-efficient way to organize and easily access your kitchen knives - as well as your tools in the garage, home office, work area, shed and laundry room.Our superior quality magnetic knife/tool bar holders are made with high quality magnets integrated into a polished stainless steel frame to hold your utensils safely in place_ from butcher to carving knives, wrenches, screwdrivers, saws, hammers, clamps, brooms and everything in between.Our magnetic holders mount on any wall with ease, so you can easily see and reach just the knife or tool you want without taking up valuable counter top or workbench space. •Save space and safely organize and access knives and tools•Magnetic bar holder mounts on to kitchen and other walls with ease•Installation screws included•Superior quality, durable stainless steel construction with integrated neodymium magnets•Sleek, modern, space-saving design saves valuable counter-top and workbench space while adding to your ease of working and joy of preparing food for your familyWant to de-clutter your cooking areas and work spaces? 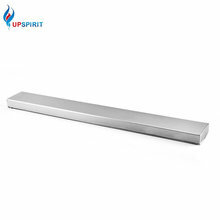 Here's a sleek, safe, super-efficient way to organize and easily access your kitchen knives - as well as your tools in the garage, home office, work area, shed and laundry room.Our superior quality magnetic knife/tool bar holders are made with high quality magnets integrated into a polished stainless steel frame to hold your utensils safely in place: from butcher to carving knives, wrenches, screwdrivers, saws, hammers, clamps, brooms and everything in between.Our magnetic holders mount on any wall with ease, so you can easily see and reach just the knife or tool you want without taking up valuable counter top or workbench space.